Gregg Greenberg at thestreet.com interviews Tom Ajamie about his book Financial Serial Killers and how investors can protect their savings from con men and scam artists who work at large and small banks and financial institutions. Tom Ajamie joined FraudTalk's Chris Marquet to discuss investment fraud and the paperback release of his book Financial Serial Killers. Philip Horn, a financial adviser at Wells Fargo, pleaded guilty to defrauding more than a dozen clients and Wells Fargo. While Mr. Horn is a relatively minor player in the pantheon of financial fraud, his actions highlight the persistent problems with policing the industry, even after the wave of rules enacted since the collapse of Bernard L. Madoff’s giant Ponzi scheme in 2008. Money Magazine responded to its readers' questions about how to find financial advice you can trust. Money consulted Tom Ajamie, Ajamie LLP managing partner and author of Financial Serial Killers, who recommended that investors enlist other professionals. Ask a trusted attorney or CPA what he or his colleagues know about the person's or firm's reputation. "They run in these circles," said Ajamie. With financial fraud on the rise, it's more important than ever to make sure the money you do have is safe. A financial fraud attorney who won the biggest settlement in U.S. history tells us how not to become a victim. Photographer, artist and author Alexandra Penney lived the good life. "I'm very careful and I saved since the time I was 16." Not careful enough: her entire life savings wound up in the hands of ponzi scheme mastermind Bernie Madoff. "The luxury that was most important that I didn't realize was a luxury was the peace of mind that you get from having some sort of financial cushion, and I don't have that." Madoff may be the scam poster-child, but financial fraud attorney Tom Ajamie says he's just one of thousands of financial serial killers. "I'd say the vast majority of these financial serial killers aren't taking millions, they're taking money from just average people." The nation's largest regulatory firm says cases of investment fraud are up 43-percent over the past year. the FBI reports corporate fraud cases and ponzi schemes are up by 111-percent and securities frauds have grown by more than 200-percent. how do you protect yourself? Tom says don't make investment decisions based on trust. "Literally thousands of people come to us saying I cannot believe this happened to me, I trusted this person." Do your homework. You can look up your financial advisor's track record at finra-dot-org. "You might be surprised to find out they're not even licensed to be doing this, number two, if they have the license you can check if they've had complaints or other lawsuits." Make sure the company that's managing your money is independently audited. finally -- the person giving you financial advice shouldn't touch your money. "Often people are writing checks out to the person giving the advice, in that person's name, you never want to do that." Alexandra learned the hard way. She's rebuilding her life and bank account one picture at a time. "Don't go pity poor me, be a fighter, it's a lot more fun." Here's a surprising fact…after studying the schemes of hundreds of convicted fraudsters, Tom Ajamie found they had one thing in common: they often bypassed the woman and asked to only deal with the man if they were working with a couple. Tom says that's because they believed the man was easier to manipulate. Allan Ehrlich, like many successful entrepreneurs, looked to friends for advice on where to invest his disposable and retirement income. So on the advice of a good friend, but not much else, Ehrlich invested some $650,000 with Bernie Madoff more than 20 years ago. “The hardest thing was to get in,” says Ehrlich, 72. He used the same strategy of asking friends when he decided to invest $1 million in International Management Associates in January 2006, one month before he found out that it too, was a Ponzi scheme. His annual investment income has fallen from an annual $200,000 to $50,000. “I grew up in a world where everyone was honest,” says Ehrlich. “A lot of this falls on me for not being a sophisticated investor,” he says. But even sophisticated investors get scammed, too. While the Madoff scam may have been the biggest financial fraud to date, it is unfortunately only one of many that have been discovered. Still, with the increasingly complicated investment platforms and volatility of the markets, many people need financial advice and money management services more than ever before. Yet the fear and mistrust of turning one’s money over to someone else is never far away. No doubt, there will always be fraudsters. But there are actions investors can take to at least minimize the chance of becoming the next victim of a financial fraud. Often those who have been defrauded failed to follow through with one of these five important steps. Of course, this advice could be attributed to any aspect of hiring a financial professional, but, in this case, we’re referring to an adviser’s background and credentials. We all want to trust what people say as the truth, and it is easy enough to be lulled into thinking that you don’t really have to check credentials. Not so. There are several ways to do a background check. First, enter the financial professional’s name into a search engine. By doing a very basic background check we have found that there have been lawsuits or brokers banned from the industry, says Tom Ajamie, an attorney and co-author of Financial Serial Killers. “Stockbrokers have been banned but then they become insurance brokers,” he says. For brokers, go to FINRA.org and click on BrokerCheck. Make sure the broker is licensed and look at complaints filed with regulatory agencies. “You may find former employers who have posted information about them,” says Ajamie. For financial advisers, go to the Securities and Exchange Commission’s website to make sure they’re licensed and that they haven’t been barred or suspended. “These are excellent tools that 99 percent of the people don’t know exist,” he says. It isn’t enough to just do a background check. “The qualifications to become licensed as a financial adviser are very loose,” says Mitchell Franklin, an assistant professor at Syracuse University’s Martin J. Whitman School of Management. Other than a National Association of Securities Dealers exam, no formal higher education, degree or experience is required, he says. To that end, investigate a financial professional’s experience, educational background, and certifications. Look for the Chartered Financial Analyst (CFA) or Certified Financial Planner (CFP) and call the governing bodies to make sure the person has really gone through the required process. This step should not be overlooked. Investors should have a separate custodial account with their name on it at a bank. “Separating custody and investment adviser functions provide the client with better control over their assets and better defends against the ability of the investment adviser to commit fraud,” says Michael Spindler, an executive director at Capstone Advisory Group LLC, where he performs forensic accounting investigations. Other safeguards may include ensuring that each trade or transaction requires approval by the investor, the investor doesn’t provide power of attorney to the adviser or allow the adviser to have ownership of any of the investor assets, third-party statements go directly to the investor and are promptly reviewed and there is transparency regarding any income received by the adviser, recommends Spindler. The old adage to diversify should be used among managers and not just among investments. You may get overloaded with reports from many managers, but you’ll be protected from losing all your money as many Madoff victims experienced. Red flags are easy to ignore, but when properly addressed, can be an investor’s saving grace. Some warning signs might include financial statements that are delayed, incomplete or have unusual items and evasive answers to specific questions. Ideally, investors should get separate paperwork from an independent source and place them side by side with the adviser’s report and make sure they agree with each other, says Robinson. Finally, look for “promises of high rates of return or returns consistently exceeding the market,” says Spindler. “Benchmark rates of return should be selected with care to ensure a meaningful comparison. Returns below or in excess of these market rates should be clearly explained and understood by the investor,” he says. In some cases, such as the Madoff case, it’s hard to see where someone might have avoided being defrauded. In that case, consider this: if an investment seems too good to be true, it probably is. You would think that after the Bernie Madoff scandal was exposed, the era of Ponzi scammers would come to an end. Sadly, this is not the case. Mueller may have stolen as much as $122 million from hapless investors. These schemes are deceptively simple. Typically, the fund manager makes no investments. He pays off old investors with funds contributed by new investors. Word of outsized returns spreads, and gullible investors—lured by the promise of reward without commensurate risk—flood the fund with their hard-earned money. Inevitably, the house of cards collapses, criminal charges ensue, and investors get pennies on the dollar, if anything. 1. Make all investments directly to a custodial account in your name only. The custodian should be a household name, like Charles Schwab, Fidelity, or TD Ameritrade. Never make a check payable to your adviser or fund manager. All checks should be payable to the custodian. You should be able to access your account from the website of the custodian. Following this one simple rule would eliminate most fraudulent conduct. 2. Beware of high returns, especially returns that are “guaranteed.” Increased returns always mean increased risk. There’s no free lunch in the investing world. 3. Don’t rush to invest. High-pressure tactics are designed to create a sense of urgency where none exists. Take your time and do your due diligence. 4. Don’t let greed sway you. Con artists prey on the greed of their clients. There’s no easy way to make money in the market. The only thing “easy” about investing is how quickly you can be conned by the false promise of a fast buck. 5. Beware the con artist posing as your friend. He belongs to your club, worships with you, is your golf partner and often your best friend. He’s also the person you would least suspect of scamming you. That’s why he’s so dangerous. 6. Remember that investing is very simple. Complexity is the best friend of the con artist. Remember derivatives? If you don’t understand an investment after a ten-minute explanation, don’t invest in it. 7. Don’t be lured by a promise of steady returns. No one legitimately makes money in all markets. If you are promised steady returns with investments exposed to the stock market, run for the door. 8. Don’t rely on the mainstream financial media for your information. Time on radio and television stations is often purchased and then made to appear like legitimate news. There’s no software or trading program that can produce positive returns over the long term. It’s the sellers of these items that profit, at the expense of the buyers. Financial scammers are tough to spot. They look just like you and me. Instead of relying on appearances and promises, follow these guidelines to Ponzi-proof your portfolio. PONZI schemes are in the news again. The Justice Department announced this week that it had brought criminal and civil cases against more than 500 people for fraud schemes that involved more than $10 billion in losses. At the same time, there has been a flurry of lawsuits from Irving H. Picard, the bankruptcy trustee in the Bernard L. Madoff case. Mr. Picard is hitting a deadline for filing lawsuits seeking to recover money for people swindled in Mr. Madoff’s Ponzi scheme, which came crashing down two years ago today. Thomas R. Ajamie, a fraud litigation specialist, said swindlers tended to focus on relatives, friends or people with common interests. But the reality is that small-time Ponzi schemes have been coming to light with regularity since the financial crisis began and investors started asking for their money back. That’s a big problem when an investment scheme is built on paying out old investors with money brought in from new ones. According to data compiled by Investment News, a trade publication, schemes involving $9.244 billion in losses have been revealed so far this year. Just this week, a former Denver-area hedge fund manager, Sean Mueller, was convicted of running a scheme that bilked some 65 investors out of $71 million. One of those investors, John Elway, the former Denver Broncos quarterback, reportedly lost $15 million. Mr. Elway, presumably, has other money to live on. But small investors who handed over their life savings to Mr. Mueller or other swindlers, will, in all likelihood, not fare well; they will probably never see that money again. So with no end in sight to Ponzi schemes, here is a look at what all investors should consider to keep their money safe. WHAT TO LOOK FOR Sadly, the people who are most likely to involve you in a swindle are friends and relatives. It has become so common that it now has its own name: affinity fraud. He said one of the most egregious recent examples of this involved Imperia Invest IBC, whose assets were frozen by the Securities and Exchange Commission in October. According to the S.E.C., Imperia defrauded some 14,000 investors out of $7 million. About $4 million was collected primarily from the deaf. The other big risk is to associate Ponzi schemes with hedge funds. The reality is that Mr. Madoff and the others who have been caught were not running hedge funds; they were running swindles. Leon A. LaRosa Jr., a partner at EisnerAmper, an accounting firm, said one of the biggest schemes he had investigated involved $400 million in fake real estate investments in Deal, N.J. The targets were all Syrian Orthodox Jews who met the schemer in their synagogue. Mr. LaRosa said an even simpler example involved the Brandywine Polo Club in Kennett Square, Pa. A member persuaded his fellow equestrians to contribute a total of $50 million through a unit investment trust that purportedly invested in stocks and bonds. HOW NOT TO GET TAKEN The value of doing research before investing cannot be overstated. But few people take the time to really do it. So how should people go about researching an investment? Randy Shain, an executive vice president at First Advantage Investigative Services, had several suggestions. First, he said, an investor should ask the manager of the fund what institutions have invested with him. If the manager has been in the business for decades yet has not secured any institutional investments, that should be a warning sign, he said. Second, people should consider the manager’s pedigree and ask where he learned how to manage money. “I don’t want to hear, ‘I’ve been trading my own account for 10 years,’ ” he said. Related to that is knowing who the manager’s bosses were at those places. Another approach is to make sure that all your investment eggs are not in one basket. Jim Kelly, a founder of HedgeServ and a 30-year veteran of the hedge fund industry, said one of the easiest things investors could do was insist that a hedge fund use different firms for the three main services it needs: a clearinghouse to buy and sell securities, a custodian to hold the money and an administrator to ensure that the value of the assets is correct. Having one firm do all three is a recipe for disaster. WHAT IF YOU’RE A VICTIM? If you have been caught up in a Ponzi scheme, most of the time there are not a lot of great options. The people who have the best chance of getting any money back are usually the biggest losers. John V. Donnelly III, a lawyer with Cozen O’Connor in Philadelphia, said he helped a client keep $1.3 million he had withdrawn from supposedly high-yielding certificates of deposit he had bought from a former Texas financier, R. Allen Stanford, accused of masterminding a $7 billion Ponzi scheme. The problem was that Mr. Donnelly’s client had invested $3 million. As for the so-called net winners - people who withdrew more than they put in - Mr. Donnelly said they would have to return the money unless they could prove they were destitute. Often, the person who loses millions does not suffer as much as the small investor who loses $50,000. That small investor may not be able to afford the legal fees to recover anything, however devastating the losses are. The reality is that most people will never get their money back. And that is why it is so important to do the research first. Tom Ajamie joins Tom Foreman on Your Money to talk about Financial Serial Killers. HUMAN beings love to read stories about financial scams. There's something about the tales of hope and promised riches, laced with deceit and glamour, that both entice and repel us. Singapore is no stranger to such scams, the latest being the Sunshine Empire scheme, in which a group of people conspired to cheat "investors" out of $180 million in a Ponzi scheme, paying earlier "investors" returns from the money put up by those who signed up later. A new book on financial scams offers some insights - and lessons - on such scams, replete with stories of some of the biggest ever. Back in the wake of the US$5 billion Busang gold scam, Houston lawyer Tom Ajamie took the long flight to a country he had only read about to represent some of the shareholders of Bre-X, the small Canadian company at the centre of the unfolding mining scandal. Thousands of small investors lost their shirts when it was revealed in March 1997 that geologists working for Bre-X had "salted" the core samples with alluvial gold to grossly inflate the size of the deposit found in Busang in Kalimantan, the Indonesian part of the Borneo island. I always metaphorically count my fingers after shaking hands with a lawyer. Whether Ajamie could be characterised as an ambulance chaser may be open to debate, but he was smart, personable and committed - and he enjoyed a beer. Always a good sign. While I kept him abreast of daily developments, he helped me understand the legal intricacies of the Bre-X scandal and, when the scandal finally blew apart, put me in touch with some of its stricken victims across North America. Today, Ajamie is one of America's top trial lawyers, with a record-breaking US$429 million stock arbitration award under his belt. But in a new book, Financial Serial Killers, he and New York journalist Bruce Kelly lament the Indonesian case as one that got away. Like everyone else, Ajamie still cannot quite believe that with the purported suicide of ringleader Michael de Guzman, Bre-X's chief geologist, no one went to jail or was even prosecuted for one of the crimes of the century. The reason, of course, was the involvement of former president Suharto's family in trying to wrest away control of the supposed 200 million ounce bonanza and the fact that in those days, corruption went unpunished. Busang, in fact, occupies just one chapter in a book that uses the ultimate fraudster, Bernie Madoff, as the entry point into what the preamble calls "The world of Wall Street money hustlers, swindlers and con men." "Sadly," it says, "Madoff is no different than hundreds, if not thousands of white collar thieves who today blight the American landscape and put you and your life savings in danger" - on Main Street as well as Wall Street. Unscrupulous insurance agents, stockbrokers and investment advisers all figure in a tour de force of the financial underworld, which also includes a long laundry list of warning signs and a tutorial on the use of Web tools to detect trouble. "Some brokers are simply salesmen," the authors say. "If they weren't selling stocks, they would be selling motorcycles, cars or electronics." Many of us probably knew that, but it is good to see it spelled out. The book underlines the risks entailed in unregulated hedge funds, private placements and mortgage schemes, and fires a shot across the bow of the Securities and Exchange Commission (SEC) for failing to detect the Madoff rip-off and other Ponzi-like schemes. Eschewing elaborate tricks, we are told the financial serial killer often exploits close friendships and even such seemingly benign traits as a shared culture and language. While he may be a thief in an expensive suit, his techniques can be quite rudimentary and unsophisticated. In the regulatory wasteland of Indonesia, there is simply no one to protect the gullible among us from personal finance managers, complete strangers who at no risk to themselves call out of the blue and say they want to play with your money. In a moment of rare candour a few years ago, one actually told me he didn't understand why anyone would accept such an offer. Ajamie does. In most cases, he says, the greed of the money man is matched only by the greed of his victim. "Greed is a natural occurrence in each of us," he notes. "We all covet something. The question is to what lengths we will go to get it." In some ways, Financial Serial Killers reads like a textbook with a break-out box at the end of each case study pointing to the various pitfalls investors face from pinstriped shysters bent on monetary mayhem. It also highlights the so-called "Smoke screen of legitimacy" that forms the key part of any mining scam, sometimes so "dense and dark" that it fools professionals, bankers and journalists alike. That was Busang. Reporters like me played a huge role in inadvertently hyping up the size of the deposit. But we were relying on warning signals from the experts, many of whom later confessed they could see the red flags all along but got carried away like everyone else. Ajamie recounts receiving death threats on successive days from two visitors to his Jakarta hotel and how he flushed sensitive documents down the toilet and changed taxis mid-street to throw off surveillance. He also writes about the refusal of Bre-X's formerly-talkative management to meet him, despite the fact that on several extended trips to Jakarta, he was acting for some of the company's biggest stockholders. In the end, the authors note that the common element in the collapse of Bre-X and later, Enron, once America's seventh-largest company, was that it was never possible to verify the true business of either company. "The bottom line is people don't really understand finances, and no one wants others to find out how little they know," the authors conclude. "So people act as though they understand money, but really they don't." Hands up, those who fall into that category. A recent report shows one out of five older Americans is a financial swindle victim. BNN speaks to Tom Ajamie, founder and managing partner, Ajamie LLP, about his new book, "Financial Serial Killers," for an inside look at the complex strategies financial advisers, insurance agents, and even family members employ to fleece hapless individuals, and how you can protect yourself from being swindled. Sniffing out the swindlers: Securities lawyer Tom Ajamie joins Dylan Ratigan to discuss his new book "Financial Serial Killers, Inside The World of Wall Street Money Hustlers, Swindlers and Con Men." Lawyer and Author Tom Ajamie on the Wall Street crooks. Tom Ajamie joins MSNBC’s Morning Joe team to discuss the rise of investment fraud, and Financial Serial Killers. Tom Ajamie, author of 'Financial Serial Killers' discusses how financial reform will impact the average investor. Tom Ajamie joins Ali Velshi on Your Money to talk about Financial Serial Killers. Financial Serial Killers: Inside the World of Wall Street Money Hustlers, Swindlers, and Con Men seems ripped from today’s headlines and it is surely interesting reading ($24.95, Skyhorse Publishing). Tom Ajamie and Bruce Kelly note that, in the fiscal year 2009, the FBI saw a 105% increase in new high-yield investment fraud investigations compared to 2008; 314 such cases versus 154. Many involved losses exceeding $100 million. The authors identify the warning signs and strategies that perpetrators of fraud use to scam average Americans out of their life savings. Ajamie is an attorney who has recovered hundreds of millions from fraudulent individuals, corporations, and organized crime organizations. Kelly is the news editor for Investment News and provides true stories of people who have been scammed, explaining how they could have avoided their losses. The problem is, like Bernie Madoff, some con artists can have good reputations. The book is full of good advice to save you from financial fraud. You’re not too young or too old to read this book. Unfortunately, the public outcry over the Bernie Madoff scandal–and the regulatory response to that outcry–has done little to stem the tide of investment fraud. From elaborate Ponzi schemes aimed at celebrity investors, to simple investment scams targeting the elderly, the desperate or the naive, scam artists continue to separate clients from their money. 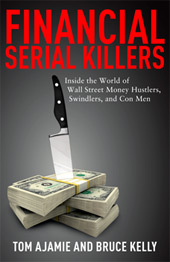 In their new book, “Financial Serial Killers,” attorney Tom Ajamie and InvestmentNews News Editor Bruce Kelly expose the world of Wall Street money hustlers, swindlers and con men. While the fraudsters have changed over the years, the authors note that their methods have stayed basically the same. And what are those methods? Here, culled from the work of Messrs. Ajamie and Kelly, are eight warning signs that a broker or adviser might, in fact, be a swindler. Ajamie, a top securities lawyer, and Kelly, news editor for Investment News, team up to recount true tales of financial frauds throughout history, which make for addictive if depressing reading. Ajamies expertise in commercial litigation gives the reader an inside look at the complex strategies financial advisers, insurance agents, and even family members employ to fleece hapless individuals, focusing on the false emotional bonds con artists create with their victims in order to take advantage of them. For those who can wade through occasionally disjointed prose with some very jarring changes in tone, there are valuable lessons for readers who want to protect themselves from being swindled. In the wake of the Madoff scandal and the financial excesses that led to the recession of the past two years, this book will appeal to many readers angered by the financial services industry, the failures of the regulatory authorities, and rogue advisers. In their new book, Financial Serial Killers (Skyhorse Publishing, 2010), to be published in August, attorney Tom Ajamie and journalist Bruce Kelly offer advice on how to avoid the thousands of mini-Madoff's out there.